I've been wanting to try a herb pie for awhile and since I had an abundance of rosemary (the potted herbs on my porch are growing like crazy), it seemed like the perfect time to go ahead make one. 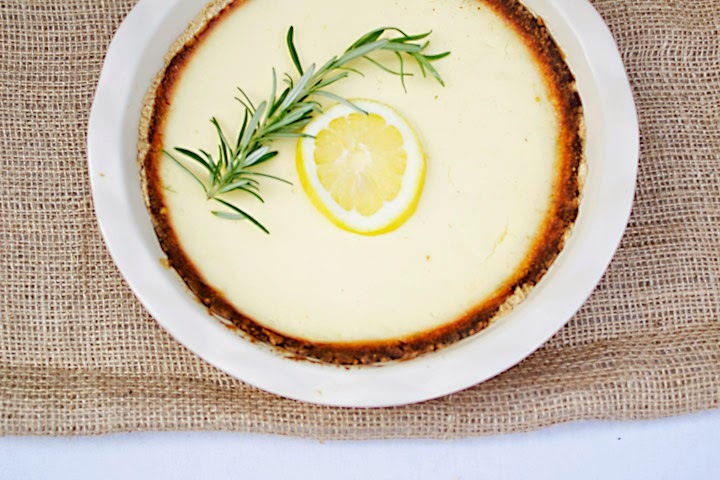 For an outdoor summer event or party like our Plant Potluck*, a light flavorful pie works really well. 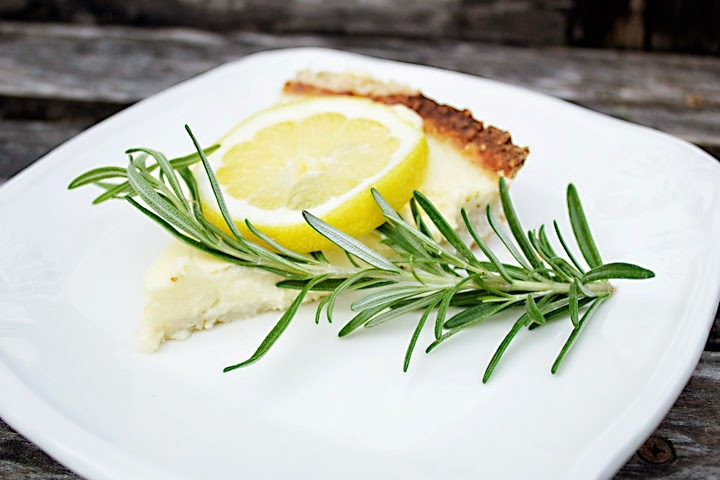 This lemon pie with rosemary crust was perfect and easy to make. The flavors compliment each other perfectly and each have a nice present, but are not overwhelming. 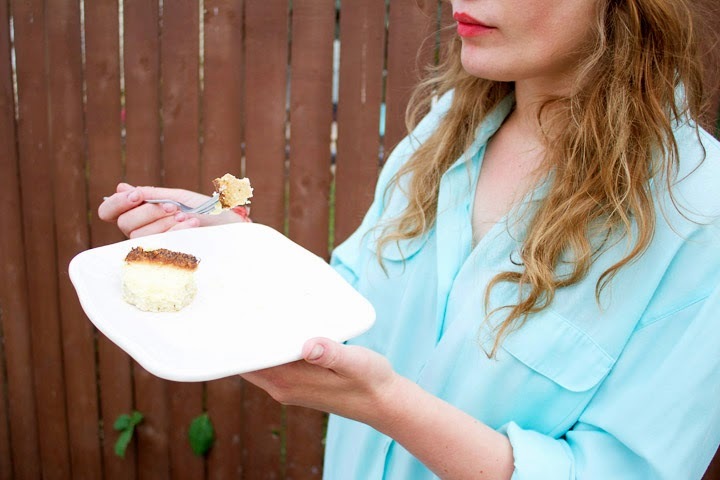 Make this pie for your next summer party (recipe below). You won't regret it! *Have you checked out the Sparkling Summer Sangria with edible flowers Lauren made for the Plant Potluck? It was a huge hit. Not only did it taste great, but it was also beautiful to look at. Mix together flour, sugar, rosemary, and salt in a food processor. Next, add in the butter and pulse until large pea sized bits start to form. Then add in just 1 tablespoon of ice water to start. Pulse a few more times and check to see if the dough holds together when pressed with your fingers. If not, add in the 2nd tablespoon. Put the dough out into a butter a 9-inch tart or pie pan. Press the dough firmly down onto the pan, working from the center out to the sides (make sure all sides are even). Use a fork and pierce the bottom of the pie a few times to avoid bubbles. Bake for 15 minutes, then cool for at least 5 minutes before adding filling. While pie crust is baking, prepare the filling. In a bowl, whisk yogurt and sugar in a bowl until combined. Next add in eggs, one at a time followed by lemon juice and zest. Whisk together all ingredients until evenly combined. Pour filling into the crust and bake for 30 minutes or until the center is set and only slightly jiggles. Cool pie completely, chill in the fridge for at least 1 hour before serving. This tart can be made the day before. Just covered and chilled in the fridge. Not only does the combo taste great Katie, but after you bake the pie, it will leave your home smelling fresh and lovely. Looks delicious! So excited to try this one! Definitely do Lindsay. It's a winner!